Great fit! I’m a 36” length, so it’s hard for me to find. While the coveralls fit well and are of high quality they need some modification for added comfort. The back pockets are positioned about 3 inches too high. The front zipper needs to be lowered about 3 inches. We have forwarded this review to our Product Design Team as a suggestion. Great quality and the fit is almost perfect. A little tight around the waist. Wish they came in a longer inseam! Thank you for your your feedback. We have shared your review with our product team. Please feel free to contact us at 1-800-833-3118 with any questions or concerns. Glad I could find my size, awesome they do pretty much any size I'm a thin tall lanky guy. Normally I wear 29 but the 30 waste 36 length is more than enough length. Good to the last Duck. Duck Bib Overalls /Unlined and the Demin Overalls are outstanding. Fit great wear great. If you are a Tad Thick in the middle go one size up. The best overalls I have ever tried. I have owned several pairs of these over the years and have yet to completely wear a set out. They are very tough and comfortable. One of my pairs is 17 years old and the elastic is still in good shape. So, buy with confidence. These are very comfortable and durable. We will definitely purchase again! Bib's that work like I need them to. These Bib Overalls are a perfect fit for me and the work I do in them. I work in a warehouse and on a gravel storage yard and I need something practical and tough but flexible. This does the job and I recommend them for any work that requires freedom of movement to get the job done. They were a gift for my son's birthday. He had a pair that he had completely worn out and was needing a replacement!! He was very glad to get them! Fits good, the legs are really wide. Would like better if they were skinnier. Other than that I love them almost all my shirts are the Henley t shirts long sleeve and short sleeve. Love Carhartt! These are amazing! They are extremely comfortable and the sides stay closed which is always a bonus. the material is tough at first but after a few wears they lose the stiffness and become nice to wear all day. These are also very easy to clean, I have worn these about 5 times in the short time of owning them and in that time I have coated them in mud, grease, and oil; all those washed out of the overalls with no problem or left over stain. All together I would recommend these to everyone. I ordered my Overalls in the same size as the Rugged Flex work pants (I have several pair) that fit perfectly, assuming they would fit just as well. WRONG. These overalls are fully 1 waist size smaller than the Rugged Flex work pants. I double checked the label to make sure I had not received the wrong size but they were what I ordered. As long as I inhale deeply and don't button the side buttons I can just wear them but without the freedom I'd bought them for. I'd send them back and exchange for a larger waist size but I got them dirty trying to wear (to see if they'd stretch) and work in them so I guess their mine. If you order some think 1 waist size larger - you can work & move well if they're a little loose but not if they're too tight. We're sorry to hear about this. Please note, this style requires you to upsize 1-2 waist sizes from your actual midsection measurement. You did not stock the size I needed 56/30 so I had to order 56/36 that's too long . had to pay extra to have them altered. not happy I have waited to order six months. We are sorry to hear this. Please feel free to contact us at 1 800 833 3118 if you need any assistance. These are exactly what I needed. It is so nice to jump into these at a worksite, not worry about getting all kinds of dirty and jump out of them easily to get to a meeting looking relatively clean. The local department store used to sell these but switched to a different type of overall. Nothing compares to these original unlined Carhartt duck bib overalls. Thanks for keeping the high quality! At work, or around the house!I love Carhartt. They make quality work clothes. These car hart bibs are great. Wish they had better clips for shoulder straps but other than that they’re Comfortable and fit perfect. QUALITY PRODUCT!!!!! I bought them for my son and it is the second pare he has had. The first pare lasted 20 YEARS. to say the least he is very satisfied. We appreciate your input. The duck fabric is very tough but will start to break in somewhat with usage over time. I wear a 31 pant so I’m already between sizes. I opted for the 30 waist cause I did not want baggy overalls. I knew the legs would already be kinda baggy so I didn’t want to go up in size to a 32 to make the legs even baggier. Turns out the 30s were too tight around the waist than preferred and the legs were borderline baggy already. I also opted to keep them. Ive worn them 4 times in 4 weeks for 8 hours straight and love the durability and pockets. I have to keep the top button undone at the waist and I find myself pulling them down on my waist throughout the day because they hug my groin pretty tight. Overall, I’m not terribly pleased with the overalls. I wish they had size 31, were trimmer in the legs and were not cut as high in the groin. We are sorry these did meet your expectations 100%. Please note, this style does require you to upsize 1-2 sizes from your midsection measurement. Please contact us at 1 800 833 3118 if you need any assistance. Built durable and comfortable to wear! This style requires you to go up 1-2 sizes from your actual midsection measurement. Please contact us at 1 800 833 3118 with any questions or concerns. I work In a metal fabrication shop and recently purchased these for the winter. They’re perfect to layer under and will keep you warm. Grow on you. I’ve cut metal, sanded and welded in them and they’re still going strong. Only negative is that zipper doesn’t function at all and All my seams are the torn apart on the front pocket after two months of working in them. Maybe add more dense coverage on the front pocket. We're sorry these did not meet your expectations and have shared your input with Product Design. Please feel free to contact us at 1 800 833 3118 if you need assistance. I received a pair of Carhart unlined bibs for Christmas. I have worn the same size bibs for 20 years. The Carhart bibs I received were same size 34/32, Carhart changed the style of their bibs, new style fits terrible. I could put a pillow in the front when I put them on. I ordered 2 pair of old style online, they fit well. Don't understand why you changed the style of your bibs. I went with the fit Carhartt recommended and they are way to tight and can’t return them because the tags were taken off. Don’t do like I did and trust their fitting system. As always, they're great, fit and function as expected. Excellent, true to size, returning happy customer! These are outstanding. With the below zero temps, my husband is glad to have these as an outer layer that is easy to move around in. These are not his first part, and certainly will not be his last. Thanks Carhartt, as always you didn't disappoint! Worth every penny! Great for outdoor work. Just wear pajamas underneath and I'm comfortable and warm all day. Got these for my boyfriend and he loves them! They arrived quickly! I recommend! Great buy. I ordered large to accommodate under layers. But it runs small on the chest. Are these considered briar proof? BEST ANSWER: I would consider them briar proof, because just this week mine saved me a trip to the emergency room I’m a welder and was grinding under a truck the grinder hung up and got away it cut through my bibs burned me a little but didn’t cut me at all !!! They are very briar proof. This is good for -30? Excellent quality well worth the money. Purchasing for my 23 yr old son. He wears either 30 or 32 length depending on brand. What is suggested length for the unlined duck bib overall? BEST ANSWER: We recommend going with your normal inseam length for this style. For further assistance with sizing please contact our Customer Service Department. Currently own the B06 duck bibs with a 36 waist and 32 inseam. The leg opening measures 10.5 inches when laying flat. The rest of the leg is so wide compared to my Carhartt duck pants (various styles) with the leg opening measuring 8.5 inches when laying flat. Love wearing bibs, but the legs are way too wide. Do any of the unlined duck bibs have narrower legs, closer to the regular leg opening of duck pants? If so, which style(s)? BEST ANSWER: Style 102776, the updated take on the Duck Bib Overall/Unlined, has a slightly narrower leg opening than style R01. The Rugged Flex Bib 102987 has a narrower leg opening than both styles. BEST ANSWER: Right-hand strap: Twist the (right) strap end to point at 3:00 and hold the female clip perpendicular to the male clip on the overalls. Insert the male clip into the female clip then twist the strap towards you pointing at 6:00. Release both ends. Left-hand strap: Twist the (left) strap end to point at 9:00 and hold the female clip perpendicular to the male clip on the overalls. Insert the male clip into the female clip then twist the strap towards you pointing at 6:00. Release both ends. The clips hold up the overalls. You slip on the overalls reach over your back to get the sholder straps . The clips on the straps slip through the buckles on the chest . Turn to seat the clip after it is inserted through the chest buckles and you are good to go. Simply they holedup your overalls . If your asking if they hold up to alot of use, then yes, they are excellent! If your asking how to use them, then turn them sideways and lock into place! The clips work just fine. Do you still make bibs with carpenter pouches? BEST ANSWER: Style R28, Duck Carpenter Bib Overall, has been discontinued. I’ve looked for a diagram of what the hooks and pocket features were originally intended for and can’t find one. I want to know what the design intentions were. For example, what’s the little slit in the chest pocket for? A name tag? BEST ANSWER: The little slit on the bib was originally designed for a pocket watch. Do y'all recommend these for concrete work in the VA summer? BEST ANSWER: Well they have double thickness on the front of the thighs. They will hold up for the work but might be a bit hot in the summer. In NM they work well for me. Well, they are plenty warm. So but be ware! Other than that, I highly recommend them!!! What would you suggest for a 16 year old who is doing Trap shooting? I don't know why you would use them trap shooting. Just jeans, shirt, and a shell pouch would work. The strap and buckle might get in the way of shooting. BEST ANSWER: Women do sometimes wear them, but determining the proper size can be tricky. Please contact Customer Service at 1 800 833 3118 with your measurements for further assistance. Why not bring back the Camo Bibs? Need them for small game season and turkey hunting. What is the weight of these overalls? BEST ANSWER: The weight of the garment varies depending on the size. Size 34x32 weighs about 2.63 lbs. The actual fabric is a 12 ounce cotton duck. BEST ANSWER: All of our garments have a 2-4% shrink ratio for the life of the garment as long as it is laundered according to the care directions. You should not notice any shrinkage. how many people have R01 made in Nicaragua? BEST ANSWER: This garment is made in Mexico and Nicaragua. the buckles are the worst I go through 10 pair of these a year and have to have them changed when I get them. PLEASE go back to the older ones????? What is the benefit of the stiffer duck if sandstone is already broken? Does it last longer? Also, could you tell me the dimension of the chest pocket on the bibs (does cell phone fit?)? Do you have any in quilted bibs, with a length of 28, and has zip to waist? Upper left outer pocket by carhartt emblem on the R01. What is that for? BEST ANSWER: goes back to when they were originally made. its a pocket for a pocket watch. the little slot right next to it is for the pocket watch chain to go into. If it's the one I'm thinking about I use it for pencils. What’s the difference in R01 & R06 ? BEST ANSWER: R01 is made of firm duck that breaks in as you use it and R06 is made of Sandstone duck that is already broken in. Why can’t I just pick a damn size???? BEST ANSWER: We are sorry to hear you are having trouble on our website. Please feel free to call us for assistance. Are the dark blue bibs as stiff as the regular brown duck​ overalls? BEST ANSWER: Yes, this style is made of firm hand duck. Do you make a 38x40 unlined bib overall? Do you make a black bib overall unlined size 40-36 or 42-36 it keeps saying out of stock??? BEST ANSWER: We apologize, we have discontinued both sizes in our black unlined overalls. What would be the best size for someone who is 5'6-5'7 approximately 120 lbs? BEST ANSWER: This style is sized based on your waist measurement. You are welcome to use our Size & Fit guide to determine which size is recommended for your waist size. Please feel free to contact us if we can be of assistance. Is it more comfortable to wear short sleeve or long sleeve shorts under theese bibs? And is it uncomfortable to wear cutoffs under them? 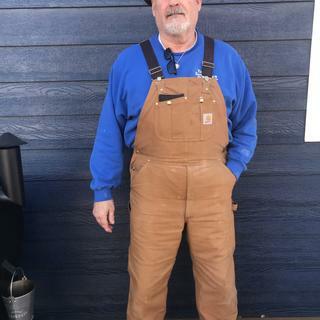 BEST ANSWER: I wear short sleeve Carhartt K87 tee shirts under my bibs about 350 days a year and they are very comfortable, I won't wear long sleeves until temperature outside is under 35 degrees. I wear them with out shorts or pants and they feel just fine. Is it more comfortable to wear a long sleeve or short sleeve shirt under theese bibs? BEST ANSWER: Depends on the weather really and work that you're doing. I'm a welder by trade so I wear long sleeve at work but when I'm at home I wear short sleeve. In the winter however, I'll wear long sleeve all the time. I think wearing either short or long sleeve shirts feels good. I wear these mostly when I'm woodworking or doing work in the yard so I am usually wearing a short sleeve shirt. Both. Can be worn with long sleeve then a short sleeve lime shirt over the long sleeve. Which ever shirt you perfer to wear, i wear both, and there both comfortable. My husband usually wears a t-shirt with his. How big are the size 28s in inches across the hips? BEST ANSWER: Measured 4" from the crotch, the measurement straight across is 38 1/2." BEST ANSWER: The suspenders are elastic. We apologize, but we are only able to ship within the US and Canada. why did you discontinue the zippers on the outside of the legs?